It was a historic day for Jerry Schmitt and the Duquesne football team as they beat Towson, 31-10, for their first FCS playoff win in program history. With the win, Duquesne (9-3) advances to the second round to play #5 seed South Dakota State. As it’s been done for the majority of the season, the Dukes running attack wore down the defense and A.J. Hines had another spectacular day. For the day, Hines rushed 28 times for 175 yards, 1 TD and caught one pass for a 71-yard touchdown. Towson jumped out to a 10-0 lead but right before the half, Duquesne drove 65 yards in 59 seconds and Mitch MacZura cut the lead to just seven points by converting on a 32-yard field goal. Whatever halftime adjustments the Duquesne coaches made worked because the Dukes dominated the second half. On their first drive of the second half, Duquesne tied the game on a 48-yard touchdown run by Daquan Worley. The drive was 6 plays, 79 yards and took just 2:35. Following a defensive three and out, Hines struck for a big play and Duquesne took the lead for good. On a screen pass from Daniel Parr, Hines ran 71 yards and Duquesne took the lead 17-10. AJ Hines cannot be contained! That reception was a career long for Hines, besting his previous high of 58 yards set earlier this year vs. Saint Francis. The score remained 17-10 after three quarters but Duquesne put the game out of reach on the first drive of the 4th quarter. The big play of the eventual touchdown drive was a run by Parr. On 3rd and 13, the Dukes quarterback ran for 15 yards and a first down. Following a 21-yard run by Hines to the Towson 3-yard line, Parr called his own number and ran it in from 3 yards giving Duquesne a 24-10 lead. The Dukes didn’t need to drive far for their last touchdown. After failing on 4th down from their own 15-yard line with 3:38 left, Hines scored his second rushing touchdown of the game to give Duquesne a 31-10 lead. After falling behind by 10 points, Schmitt’s team scored the final 31 points to move on in the FCS Playoffs. Kickoff time for next Saturday’s game at Dana Dykhouse Stadium in Brookings, South Dakota is set for 3 PM. 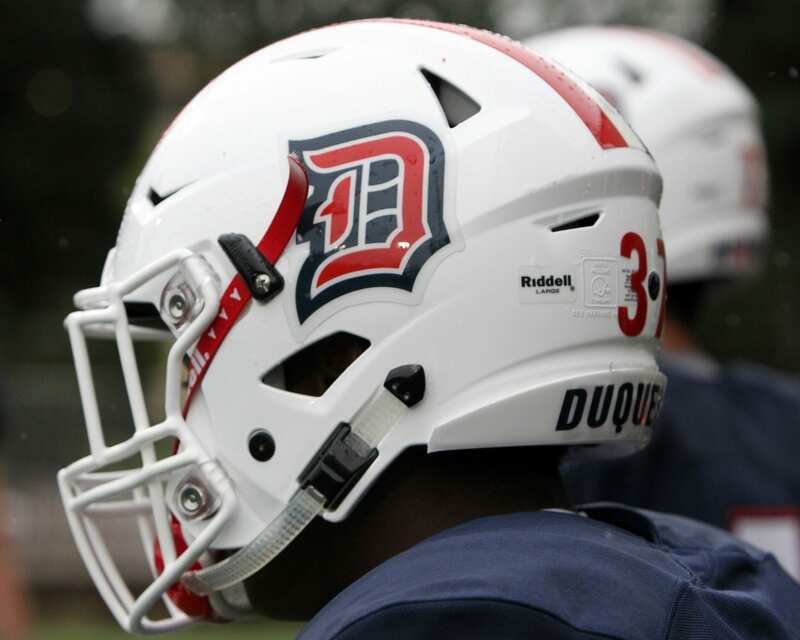 *Duquesne now has nine wins for the first time since 2011. *Duquesne becomes the second NEC team to win a playoff game (Wagner beat Colgate in 2012). *Hines has rushed for over 100 yards in 6-straight games. His 15 rushing touchdowns are a single-season program record. *Duquesne held Towson, the top scoring team in the Colomial Athletic Association, to their fewest points off the season.